I believe we (me and my bandmates) have an answer for the somewhat complicated and inefficient stage setup we've always had before, with the multiple rack cases and cabs and associated cabling. We typically run two 4x10 cabs for bass and two 4x12 cabs for guitar (with the more complicated stereo split-wiring on each cab), one or two Behringer Ultrabass heads, a 4U rackcase for my tube poweramp, and another 4U rackcase for my preamp, fx processor, and Powerblock. I'm used to setting all this up as quickly as needed but it is a bit more stressful than it needs to be. 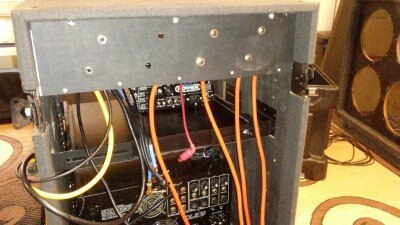 Time to ditch the rackcases, bass heads, and extra cable connecting/disconnecting between individual rack cases. Greetings from the Megarack! The lord Megarack! The Warrior of the Wasteland! The Ayatollah of Rock and Rolla! A separate "breakout" panel has been mounted in the back for all speaker connections. HIGHLY RECOMMENDED! This prevents all the wear and tear on the actual component jacks from plugging and unplugging all the time. High quality cables and Switchcraft jacks and plugs were made to connect the poweramps to the breakout panel. They aren't labelled yet in the pic or finished with connecting everything in this pic but you get the idea. So we get to the venue, unload ONE rackcase and plug everything into it and go. About as "flyrig" as we can get without compromising everything already going on. This is something I've been thinking of doing for a long time now, we were pretty lucky to find the rack case for a steal locally, and with the extra poweramp too. It's big, but actually easier managed with two people making one trip Load In/Out than one or more people making several trips with multiple amps, cases and whatnot then noodling the cables all over. Looks like a great idea. Is this where your 2u rack chassis was going to be used? The 2U chassis was going to be used to mount or re-house the Powerblock somehow. But Megarack came with a sliding shelf thing, and it's perfect for just fastening the Powerblock down to that. 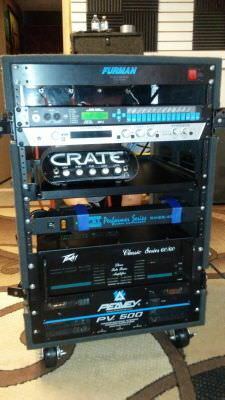 Very cool Kim , breakout panel is a good idea, we used to do that on PA racks. About as "flyrig" as we can get without compromising everything already going on.